Is Trump’s Embrace of Dictators a Perpetual US Foreign Policy? Trump Administration changes image of US foreign policy, but has it changed the approach? At the end of April, Donald Trump invited Philippines President Rodrigo Duterte to Washington for a state visit, despite the fact that his regime has been accused of extra-judicial killings. 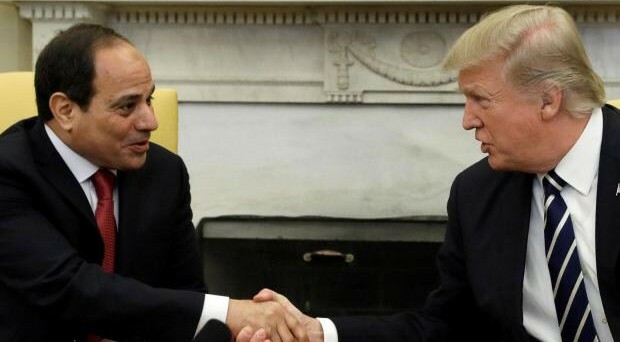 At the start of the month, Trump was effusive in his praise of Egyptian leader Abdel Fattah El Sisi as they met in the White House, with no reference to the 2013 coup in Cairo and the subsequent mass detentions and killings. And in mid-May, he warmly greeted Turkey’s President Recep Tayyip Erdoğan. Amid the high-profile welcome of strongmen, Secretary of State Rex Tillerson explained that human rights was no longer a priority for US foreign policy, as the demand that allied countries accept American values could create obstacles to the achievement of US security and economic interests. This was a definite change in the optics of US foreign policy, with adverse comment throughout the media, but was it really a change in the realities of long-standing US foreign policy? In contrast, the US left sees little real change. Rhetoric notwithstanding, they say, the main thrust of US foreign policy since 1945 has been support of “ the world’s worst despots”. Trump’s dictator-friendly handshakes and eulogies are only the latest incarnation. Both the liberal and left views have some truth to them, but US foreign policy is too complex for their reductions. The US has supported dictators under every President. However, America has also sometimes championed democratic reform in friendly authoritarian states. Rather than being driven solely by an impulse to export democracy and human rights, or to support allied strongmen who might have no time for such niceties, Washington’s priority has always been political stability in key countries — whether the pragmatic calculation is support of autocrats or democrats. In the 1980s, the Reagan administration supported democratic change against dictators such as Ferdinand Marcos in the Philippines and Augusto Pinochet in Chile, even though both regimes were anti-communist and provided the US with access to military bases and important strategic positions. By the mid-1980s, Reagan officials had calculated that the two dictatorships, crushing open dissent and seeking to keep themselves in power through rigged elections, were pushing ordinary citizens to support more radical opposition groups. That raised the chances of violent anti-American revolutions: far from guaranteeing stability, Marcos and Pinochet were undermining it. To create the desired stability, the administration pressured both dictators to hold free and fair elections. The US also used democracy-building programs run by the Agency for International Development and the National Endowment for Democracy to funnel aid to political parties and unions which accepted Washington’s priorities. In the Philippines, the US gave millions of dollars to opposition trade unions and election observers, while in Chile, USAID and the NED provided campaign aid for pro-US parties. Both Marcos and Pinochet lost elections they had believed they could win or fix — and when they insisted on clinging to power, they were replaced by more stable – and popular – pro-US democrats, with revolutionary forces contained. The use of “democracy” to promote stability and US interests continued in the War on Terror. After the 9/11 attacks, George W. Bush pushed for gradual democratization in friendly Arab autocracies such as Egypt, arguing that the repressive nature of these governments was responsible for the rising popularity of Islamist anti-US terrorist groups. Barack Obama, faced with the collapse of the Mubarak regime in Cairo, supported a transition to democracy to try to contain the rise of the Muslim Brotherhood. But US support for democratization in allied dictatorships was never a global strategy. It was deployed in specific countries where Washington’s policymakers believed democratic change would contain anti-American movements. Reagan, Bush, and Obama all continued to support dictatorships which they believed were stable and capable of containing revolutionaries. For all his bluster, Trump’s current policy echoes the last few years of the Obama Administration, which rowed back on democracy promotion — especially in the Middle East, where Obama depended on dictatorial Arab allies to fight the Islamic State. You can even argue that the current administration is just more honest about the priorities of US foreign policy. The tests of Trump and his advisors will be how they deals with two key issues. The first is maintaining the funding and operational independence of US government and government-funded organizations which promote democracy. Trump’s proposed merging of the Agency for International Development with the State Department, together with a 37% cut to State’s budget, is likely to cut funding for democracy programs in the developing world. The integration of US democracy promotion organizations with the national security bureaucracy will probably limit their ability to act in dictatorships favored by the administration. The second test will be how Trump reacts during a future political crisis – say, in Saudi Arabia or Egypt again – where a US-supported dictatorship becomes unstable and those lining up to replace it are either anti-US revolutionaries or pro-US democrats. Trump may want instinctively to support his dictatorial friends, but if the US democrats may be more likely to keep hostile forces out of power, which way will he jump? Trump’s initial rhetoric may not be the best guide to his administration’s future attitudes to dictators and democrats — after all, Reagan, Bush and Obama showed little interest in exporting democracy when they first came to power, but ended up deploying it where and when they were convinced it was a useful vehicle for safeguarding US interests. Instead, the President — if indeed the President is making the decisions — will determine through his actions if he is just the latest US Commander-in-Chief to choose the pragmatism of “stability”, be it over unending smiles for dictators and an undiluted exaltation of “democracy”.